Graduate student forward Patrick Steeves drives past a Dukes defender during a men's basketball game Wednesday night in the Smith Center. After two games on the road, men’s basketball returned to D.C. Wednesday night for its closest game of Atlantic 10 play so far. The scoring margin between GW and Duquesne never reached higher than seven points, and the outcome of the contest was undecided until the final moments. Baskets from graduate student forward Patrick Steeves, senior guard Yuta Watanabe and freshman guard Terry Nolan Jr. gave the Colonials a 6-0 run in the final 25 seconds and cut their deficit to one point. But, with less than five seconds on the clock, GW called a timeout and attempted to force the Dukes to turn the ball over. Duquesne (15-8, 6-4 A-10) held on to the ball and sunk one of two free throws with 1.7 seconds on the clock to defeat the Colonials (9-13, 2-7 A-10) 75–73. Joseph said he was proud of his squad’s ability to compete late in a close game. Colonials’ conference games prior to Wednesday have been decided by an average of 18.4 points. 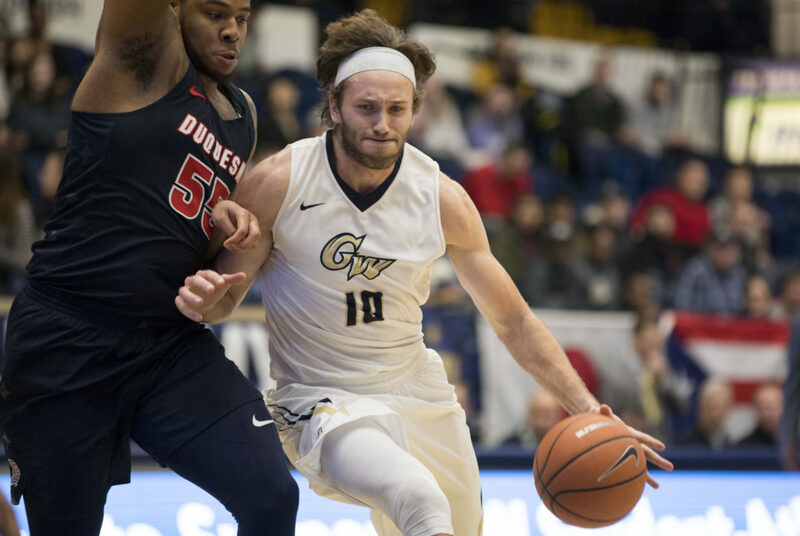 The loss was GW’s third consecutive and seventh in their past eight conference games, dropping the team to last in the A-10. But after the game, graduate student forward Patrick Steeves said he did see positives from the matchup given the Colonials’ 17-point road loss earlier in January. Steeves led the Colonials on the offensive end with one of his best performances of the season. He tied his season-high 23 points, shooting 9-for-11 from the field and grabbing a game-high six rebounds. On a number of occasions during the game, Steeves took and made one-handed floaters in the key that shifted the game’s momentum. In an effort to improve the team’s matchups, Joseph went with freshman guard Justin Mazzulla in the starting lineup for the first time all season and played him a career-high 32 minutes – using sophomore guard Jair Bolden off the bench and often playing with a smaller lineup. The remainder of GW’s backcourt – Watanabe, Nolan and Bolden – combined for 41 points on the night and six three-pointers. As a team, the Colonials shot 50.9 percent from the field – their second-highest mark of conference play. Joseph said the team focused on playing with pace, which led to a season-high 23 assists out of 27 baskets. The Dukes matched GW’s efficiency, shooting 50.0 percent from the field and 64.3 percent from behind the arc. But Duquesne’s top scorer, sophomore guard Mike Lewis II, was held to just two points in the second half. One of Duquesne’s biggest advantages was their consistency in turning second chances into points. They grabbed nine offensive rebounds on the night, resulting in 18 additional points. The contest was close beginning in the first minute. Steeves and Lewis matched baskets to start the game and the Dukes led 9–7 after six minutes of action. Duquesne made a couple easy baskets and led by six points just two minutes later, but two hook shots from Steeves and a mid-range jumper from Watanabe knotted up the game at 16. The two sides made free throws and inside baskets that tied the game up three more times before a contested layup from Mazzulla allowed GW to take its first lead of the game four minutes before halftime. The Dukes responded with a 7-1 run, including a three from Lewis, but free throws from Watanabe and Steeves gave the Colonials a 36–33 lead at the break. To begin the second frame, Nolan sunk consecutive shots and GW led by as many as six points, but the lead didn’t last long. The Colonials never had another large run until the final minute of the game and relied on Steeves inside the paint and perimeter shooting to stay in the game. Dukes junior forward Marko Krivacevic played just seven minutes on the night but made two important three-point shots in the final 10 minutes of action to maintain the lead. The Colonials return to action Saturday at 4 p.m. for a rematch with Davidson at the Smith Center. The Wildcats held GW to its lowest scoring total of the season earlier in January.